Need help luring the woman or man of your dreams onto a boat? Hungry for Rum Ham but don't know how long to cook it? Confused as to the legality of keeping birds as pets in your particular home state? Look no further, loser. The gang from Paddy's Pub have combined forces to weigh in on life's most important topics: Relationships, Financial Success and Career, Fashion and Personal Grooming, Health and Diet, and Survival Skills. 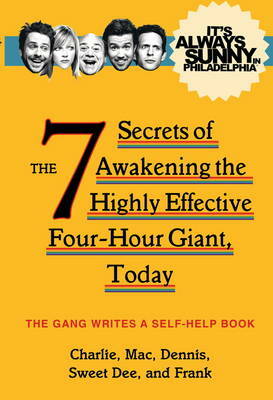 Grab a beer, throw caution and common sense to the wind, and welcome the most influential work in the history of the written word (or at least since the script for The Nightman Cometh): The 7 Secrets of Awakening the Highly Effective Four-Hour Giant, Today.